WASHINGTON, DC -- An obscure private Ukrainian natural gas company has been hiring friends and family of Secretary of State John Kerry and Vice President Joe Biden, while seeking to influence Congress. Hunter Biden waits for the start of the his father's, Vice President Joe Biden's, debate at Centre College in Danville, Ky. on Oct. 11, 2012. When Vice President Joe Biden’s son, R. Hunter Biden, joined the board of a private Ukrainian oil and natural gas company this spring, he explained his new job as a legal one, disconnected from any effort to influence the Obama Administration. In a press release, the younger Biden boasted of his abilities on issues like improving corporate transparency. But the company, Burisma Holdings, did not disclose at the time the scope of their plans for influencing the U.S. government. Recently released documents show that Biden’s hiring coincided with the launch of a new effort to lobby members of Congress about the role of the company in Ukraine and the country’s quest for energy independence. State John Kerry, signed on to work as a lobbyist for Burisma on May 20, 2014, about a week after Biden announced he was joining the company, according to lobbying disclosures filed this month. Leiter’s involvement in the firm rounds out a power-packed team of politically-connected Americans that also includes a second new board member, Devon Archer, a Democratic bundler and former adviser to John Kerry’s 2004 presidential campaign. 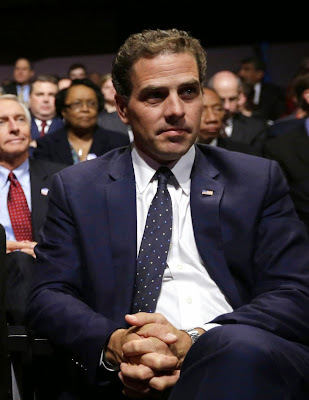 Both Archer and Hunter Biden have worked as business partners with Kerry’s son-in-law, Christopher Heinz, the founding partner of Rosemont Capital, a private-equity company. Biden’s office referred questions to a Burisma spokesman, who says Biden has not been involved in contacting members of Congress or the Obama Administration about the company. “His role, like all board members, is to provide strategic guidance to Burisma,” said Lawrence Pacheco, who works in Washington D.C. for FTI Consulting, a communications firm that is also employed by Burisma. But Burisma is contacting officials in Washington through Leiter’s lobbying firm, ML Strategies. “ML Strategies is working with Burisma to educate U.S. officials about the company and its role in creating a stable and secure energy future for Ukraine, not any specific policy or legislation,” Pacheco said. Some Democratic senators, meanwhile, have been working to secure more U.S. funding, either directly or through entities like the Export-Import Bank, to improve Ukraine’s domestic energy production potential. On June 27, Sen. Edward Markey of Massachusetts, wrote President Obama a letter with three other Democratic senators calling for increased aid. “We should leverage the full resources and expertise of the U.S. government to assist Ukraine in improving its energy efficiency, increasing its domestic production, and reforming its energy markets,” wrote Markey, who has also proposed legislation with about $40 million in additional aide for Ukranian energy development. Markey’s letter was trumpeted by Burisma Holdings as a commendable move towards securing the future security of Ukraine. “Burisma Holdings today applauded the range of U.S. legislative support for development of Ukraine’s broad and untapped resources and an increase in transparency and good governance,” the company said in a statement on the day the letter was released. An aide in Markey’s office told TIME that Leiter, Biden and Archer were not part of discussions that led to the drafting of the letter or the legislation. Staff for the other senators who signed the letter, Ron Wyden of Oregon, Jeanne Shaheen of New Hampshire and Christopher Murphy of Connecticut, also said they did not have contact with Leiter, who could not be reached for comment. Burisma Holdings is owned by a Cypriot holding firm, Brociti Investments Limited, which is controlled by Nikolai Zlochevskyi, a former Ukranian government minister, according to Cypriot records. It controls government development licenses in three regions of Ukraine, and sells to industrial customers in the country, according to the company. By taking a job with Burisma, the younger Biden has put himself in the middle of a struggle between the United States and Russia, which currently provides the bulk of the natural gas supplies to Ukraine. Both the White House and European nations have recently emphasized the strategic interest in making Ukraine less dependent on Russia. Since Hunter Biden took the new job, his father, Vice President Joe Biden, has continued to serve as the Obama Administration’s point person on Ukraine, traveling to the country as recently as June for the inauguration of President Petro Poroshenko and talking to Poroshenko by phone at least five times in the last month. “I’ve spent a considerable amount of time in the last two months in Ukraine,” the elder Biden said on June 19. “You see what the Russians are doing relative to using gas as a foreign policy tool to try to alter behavior. There is no legal barrier to prohibit Hunter Biden from working with a company that can be impacted by the policy decisions of his father, and the White House has maintained that the Vice President has not been influenced by his son’s employment. “The Vice President does not endorse any particular company and has no involvement with this company,” said his spokeswoman Kendra Barkoff. But Hunter Biden’s new job, along with the association with Burisma of other politically-connected businessmen, has raised concerns among some Ukraine watchers. “It’s unhelpful when we are trying to get across to the Ukrainians to clean up corruption and special deals for special folks,” said Ed Chow, a senior fellow at the Center for Strategic and International Studies, a U.S. think tank.